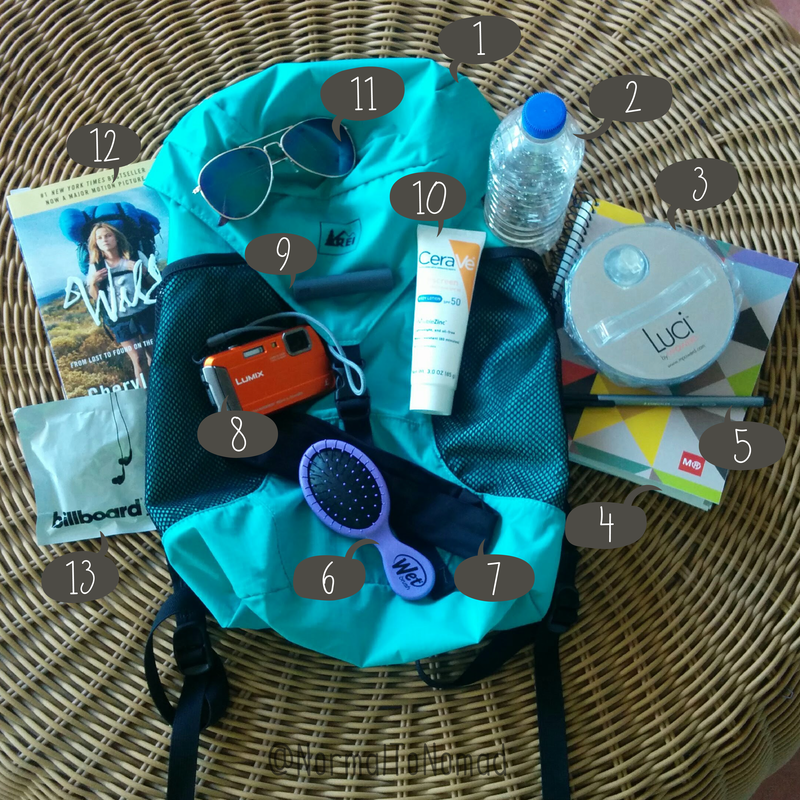 I always enjoy seeing “What’s in my bag” blog posts and videos, so I thought I would do a version of that myself for my pool/beach bag. This bag stays more or less the same whether lounging at the pool, going out for a day at the beach, or even on an all day snorkeling excursion. Read all about each item below! REI Stuff Travel Daypack: You could say I have a little bit of a bag habit. And not handbags, but daypacks. That being said, I have quite a few daypacks. I bought this one with a few specifics in mind. I needed a bag I could scrunch down to as small as possible to fit into a multi-day backpack, I needed a bag that had comfortable straps and I needed a bag that had outer side pockets for water bottles (a must for me). This bag has everything, and I couldn’t be happier with it. You can even pack the bag inside itself in the lid for compact travel. On this trip to the DR I carried this bag inside my carry on bag and used this pack everyday, whether going to the beach, the pool, or on our off-resort adventures. I love that although this bag is thin and small enough to be compact, it’s still sturdy enough to hold a ton of weight comfortably for long periods of time. I can’t find a volume anywhere online, but I would guess this bag comes in around 16-18L. Bottled water: Don’t leave home without it. Luci light: I’m obsessed with these. It helps that I worked for the company for over a year and saw how amazing they were on a daily basis, but now that I’m an almost daily user I cannot emphasize enough how great these are. I carry a light with me everywhere, and it comes in so handy! Power outages are very common in the DR, even on the resorts (the power went out in the restaurant at dinner a few nights ago), so it’s always great to have a charged up solar light at the ready. Luci weighs practically nothing and takes up very little space. Since it deflates to a flat disc, there’s never been a situation in which I couldn’t squeeze one in. Stone paper notebook: These are so cool. Stone paper (yah, it’s paper made from stone) is tear resistant and water resistant, making it ideal for outdoor activities. I am a big note taker and list maker, so this fancy paper that I can take anywhere is awesome. I get my stone paper notebooks at Target. A pen: Can’t tell you how many times a week I need a pen when I’m out and about, whether traveling on not. I try to always have a pen in my bag, no matter where I’m going or what I’m doing. Tiny wet brush: I don’t normally do a lot with my hair when traveling, especially in such a windy, hot and humid climate like the DR. I love Wet Brush at home, and was pumped to find this tiny travel version to save some space. I also really like how far the bristles of the brush are spaced out, since my naturally curly and frizzy hair can be a nightmare to brush in the aforementioned climate. Lots of space between bristles makes it a lot easier to brush out my messy mane. Headband: Not just any headband. I found these Remington yoga head wraps that I love for the windy beach. They aren’t so tight that they slip off or give me a headache, but snug enough to not be too loose. They also can be worn as a thin headband, or expanded to a thicker style that can cover almost my entire head from hairline to ponytail to keep things in check. I always pack a couple for any beach vacation. For me and my wispy hair around my face these are a must. Underwater camera: Currently using a Panasonic Lumix DMC-TS6D. It’s nothing fancy, but it’s great for splashing around in the surf or on a casual snorkeling trip. I’m still getting used to it, but feel like I’m finally comfortable enough to get some reliable shots on it. For a cheap camera, it’s doing just fine, although I’m already itching to upgrade to a fancier underwater model. Most of my recent shots on Instagram, Twitter and Facebook have been either with this camera of my Nexus 5 Samsung Galaxy S6 phone, although when I’m closer to home I’m still most comfortable with our Canon Rebel XSi. Lip SPF: Maybe my all-time favorite beach/pool item is Bite Beauty SPF 15 BB for Lips. This product seems to be discontinued which, frankly, is sending me into a little bit of a panic. This product is so perfect for a bit of color, moisture and SPF. The color is sheer enough that even when you’re getting sweaty or splashing around it isn’t noticeable if it moves around. And I love the scent and taste. Sunscreen: You should be wearing it everyday anyway. Do as I say, not as I do. Anyway, I love CeraVe products, and this sunscreen is great. I don’t have especially sensitive skin, but sunscreens, even when advertised that they won’t break me out, sometimes do. This CeraVe sunscreen is technically for body, but I find it sits nicely on my face and doesn’t break me out at all. My dermatologist recommended I use CeraVa products (and nothing else) and I really enjoy their products (and price points). Sunglasses: Protect your eyes and avoid the squint. These babies cost me a whopping $3 at H&M and are possibly the most comfortable sunglasses I’ve ever owned. Just picked them up as a cheapy pair, didn’t even try them on. Weird how that happens sometimes. I never pay more than $10-$15 for sunglasses; they always end up lost or broken. Something to read: I typically load up my Kindle, but I had started this book and wanted to finish it on this trip, so I’m going old school with a paper book. I get bored at the beach VERY easily, so I need something engaging to keep me from ditching my husband early in the day, if the water isn’t great that day. Headphones: Sometimes people at the beach will play music on a phone or radio and it drives me bonkers, so I like to keep an emergency pair of headphones with me, just in case. I also like to do a guided meditation with Headspace on the beach, so headphones come in handy then, too. On our flight down to the DR we got these great packaged headphones and I thought that was a nice option for a bag that would probably be getting wet. This packaging should keep the contents dry until I open it. So there you have it! I’d love to know what’s regularly in your beach bag – leave a comment below! For sure! I carry a hat with me a lot and should have added it to this list. Great idea, thanks for the reminder!